Selling your house can be an exciting and rewarding experience. However, the prospect of opening your house for inspection to complete strangers may spark privacy and safety concerns. The following article looks at a few precautions you can take to maximise the marketability of your house while minimising the security risk. You may think that rare oil painting adds appeal to your property, but in reality it may attract the wrong kind of interest. Most people who visit your property during inspection times are honest house-hunters looking to make a good investment. However don’t risk losing your precious personal items in the hope to make a good impression. Store away all your prized art, vases, silverware, jewellery and other valuables and place replace them with neutral prints, plain vases and plants. It is also advisable to remove, where practical, any expensive technological equipment such as plasma screens, computers and ipods. Vendors often feel adding personal touches such as photos, trophies, collectibles medallions and souvenirs add “human appeal” to the property, but in reality they prove more detrimental than beneficial. Firstly, there is a risk of them being swiped by illegitimate buyers. Secondly, putting “your own brand” on the home momentarily shatters the buyer’s illusion about living in the house themselves. So pack all your personal items and remove them from your property in a secure storage unit. This also removes a sense of “clutter” from the house, making it look more spacious and attractive to prospective buyers. In the age of increased identity fraud and credit card scams, the last thing you want is a stranger to gain access to personal information such as credit card details, bank statements and other identity-revealing documents. So prior opening your home for inspection, empty your post box and lock all your sensitive information away. This includes passports, car registration and insurance details and confidential work-related information. It is also important not to leave cash lying around or in visible places such as in open drawers and clear jars. Avoid publicising the fact that you are on holidays. Your real estate agent will also offer tips to make your home more marketable such as ways to improve your décor, lighting, cleanliness and tidiness as well as any necessary repairs/improvements. • Confirming you’re insured for the right amount to cover the replacement costs of your contents at today’s prices. Keeping your property well lit to minimise cover for intruders if they try to break in. As a vendor, you should be ready to show your house while protecting it at all times. 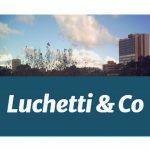 Speak to us at Luchetti & Co so that we can help you settle your property securely and professionally.